“You’re going to Guatemala? I really wish you’d reconsider your decision,” said my friend Henry. “I hear it’s dangerous down there.” Henry wasn’t the only one with concerns. Plenty of acquaintances wondered what my friend Amanda and I were thinking, when we boarded a plane to Guatemala earlier this year. We were thinking that Guatemala (which is sandwiched between Mexico to the north, El Salvador and Honduras to the south and Belize to the east) is home to vast rainforests, volcanoes, Mayan sites, mountains, cobblestone villages, postcard-pretty beaches and major cities – meaning we could effectively combine several holidays in one. Sure Guatemala suffers from a bit of a public image problem (the Foreign Office website claims that 5,000 violent deaths occurred in the country in 2015 alone) but I’m here to tell you that situation on the ground couldn’t be more different from what’s reported in the media, with most deaths being almost gang murders that don’t affect tourists. Praised by 19th century travel-chronicler, John Lloyd Stephens, as being "the most magnificent spectacle we ever saw”, Lago de Atilan can’t fail to charm even the most jaded of traveller. Indeed its lure is so strong that many foreigners now call Lago de Atilan home, having fallen for the area while on holiday. This beautiful Highland lake – which is at least 320m deep and measures 18km by 12km at its widest point – is ringed by small towns, each with their own character. Panajachel is the most popular resort town and therefore the busiest, being crammed with travel agencies, tuk tuks and dive bars. Quieter, more peaceful options include, Santa Cruz La Laguna and Jaibalito. Looking to party? 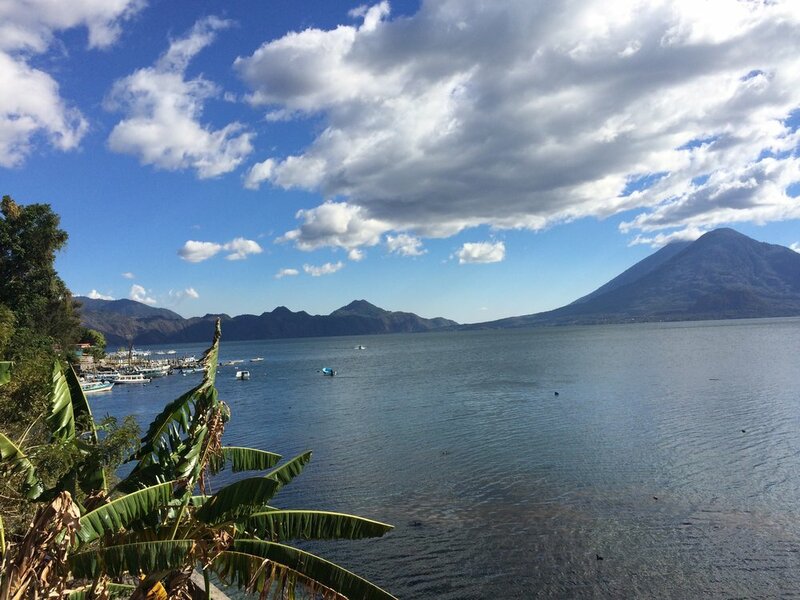 San Pedro La Laguna is where it’s at, but the prettiest and most laid-back late is San Marcos. Less than an hour away from the concrete jungle that is Guatemala City, lies Antigua – one of Guatemala’s most appealing destinations. This picturesque colonial town is packed full of cobblestone streets lined with elegant buildings, whose yellow and orange facades are framed by a backdrop of three volcanoes. Browse the the craft markets, galleries and chi chi shops before stopping off for an enchilada (a super Central American pie) in a spot such as Cafe Condesa (cafecondesa.com.gt), a charming old world cafe that’s set around the patio of a 16th century mansion. What’s the number one tourist attraction in Guatemala? Take a bow Tikal, the mother of all Maya ruins. Here the reminders of a once great Mayan civilisation cast their compelling shadow across the Guatemalan landscape. Towering pyramids pierce the skyline as visitors gaze upon the remnants of what was one of the most dynamic and sophisticated civilisations. Santa Elena is the town that most tourists stay in, when taking a day trip to Tikal. However I’d recommend giving Santa Elena a miss (unless banks, buses and shopping malls exert a pull on you) and basing yourself in the island town of Flores. Set against backdrop of the emerald waters of Lago de Peten Itza, Flores is far prettier – and full of boutique hotels (many of which boast rooftop terraces), and fabulous restaurants where you can feast like a king for less than 100 quetzal (under £10). A couple of places worth knowing about… Overlooking the lake, Raices (7867 5743) specialises in seafood and chargrilled meats and enjoys possibly the prettiest setting in Flores for a meal. Meanwhile Cool Beans (5571 9240) is a laid back hangout whose verdant garden is a great spot for a light bite. Sometimes all you need is a little sun, sand, and sea… if you agree, look to Livingstone. The beaches in Livingstone proper are nothing to write home about, but venture a few kilometres to the north west and you’ll find beauties like Playa Quehueche and Playa Blanca (be prepared to take a boat to get there). Beyond the beach, don’t miss Los Siete Altares – an array of freshwater lakes and pools. A series of boats make the journey to Los Siete Altares but, if you like walking, it’s a pretty walk along the shore of Bahia de Amatique. Guatemala's Semana Santa isn’t like any Easter you have ever experienced. The country comes alive with its annual ‘Semana Santa’ Holy Week, especially the city of Antigua which covers its streets in intricate alfombras (carpets) as well as quetzals, flowers and crosses in preparation for the processions on Good Friday – which are announced by a battalion of roman soldiers. It’s a cliche I know, but to miss Semana Santa in Guatemala is to truly miss out. Guatemala’s capital is often in the headlines for all the wrong reasons – read crime and congestion – but don’t be scared by its sinister reputation. True Guate (as the city is affectionately known) can’t be described as an effortless destination – it’s undeniably dirty and big – but the country’s capital is cleaning up its act. Subsequently those who do decide to explore this fascinating city are guaranteed brilliant museums and galleries and, in areas, like Downtown Zona 1, a new wave of bars, restaurants and cafes. Still inclined to skip the city? You might not have a choice: Guate is the transportation hub of the country. Wherever you go in Guatemala, a welcome as warm as the weather is assured. Even off the beaten track, out of the big three tourist areas, Guatemalans will go out of their way to help – and you’ll leave having amassed a book’s worth of tug-at-your-heartstrings experiences. Guatemalans have rightly earnt a reputation for being among the happiest people in the world, despite the poverty and hardships they endure on a daily basis. They don’t ask for more from life than it can give, and as such smiling faces are evident everywhere: from the taxi driver who starts crooning his favourite tune to help pass the time while going absolutely nowhere when stuck in Guatemala City traffic, to the teenagers playing an impromptu football game on the rubble.